Set in sylvan surroundings, two sites in Hai Duong Province get visitors in touch with the nation’s spiritual roots and the traces left by people who play important roles in making Vietnam’s history. By all accounts, the Con Son – Kiep Bac complex is a propitious place. It has been recognized for centuries as a sacred, prime location by fengshui standards. It is surrounded by four mountains named after four holy creatures (or parts thereof) common in many Asian myths, especially in East Asian countries: Phuong Hoang (phoenix), Ky Lan (qilin – a mythical unicorn), Rua (turtle), and Tran Rong (dragon’s forehead). It is also located next to Luc Dau Giang (six river heads), where six rivers – Cau, Thuong, Luc Nam, Duong, Kinh Thay, and the main stream of Thai Binh – meet. It is small wonder, then, that the place has drawn the most famous people in the country’s history, from Nguyen Trai (1380-1442) – a Confucian scholar, politician, strategist and poet of the Le Dynasty (1428-1527) to Vietnam’s first president Ho Chi Minh (1890-1969). The “complex” has inspired them and evoked deep reflections on life. For feudal generals, the complex in Chi Linh District was an ideal base for their forces. However, it was during the Tran Dynasty (1225-1400) that the natural complex transcended to a truly holy site with the building of the Con Son Pagoda on a 200-meter mountain of the same name. It became one of the three centers of Truc Lam Yen Tu - Vietnamese Zen Buddhism founded by one of the Tran kings, Tran Nhan Tong (1258-1308). When the next dynasty, Le, took over, the pagoda, also known as Hun, was upgraded into a magnificent building with 83 rooms and 385 Buddha statues. The pagoda has undergone many changes over the centuries, and lost some of its old grandeur, but it is still a venerable structure watched over by the green canopies of giant, old trees. Traces of the past in the pagoda include 3-meter high Buddha idols dating back to the Le Dynasty, a 600-year-old adenium tree in the yard and a 14th century stele with the writings of King Tran Due Tong (1372-1377). It also has a separate house where statues of some feudal officials are worshipped. One is of Tran Nguyen Dan, an official in charge of land and personnel matters under several Tran kings, and others are of Nguyen Trai and his concubine Nguyen Thi Lo. Close to the pagoda is a three-storied tower named Dang Minh Bao Thap, built under the order of King Tran Minh Tong (1314-1323) to worship the pagoda’s head monk Huyen Quang (1254-1334). From the pagoda, visitors can climb some 600 stone steps located among a pine tree forest to reach the mountain’s top and see the “fairy chessboard.” The “board” is actually a big flat stone and the legend is that it was used by fairies to play chess. On the mountain top stands a two-floor watch tower with an ancient architectural style that gives visitors a panoramic view of the complex. Other sites around Con Son Pagoda that should not be missed include the Gieng Ngoc (jade well) believed to be the “breath of life” of the whole mountain, built by Huyen Quang, the third successor of Truc Lam Yen Tu, following a divine revelation that came to him in his dream. The well’s water stays pure and fresh throughout the year. The Con Son Spring, which flows for three kilometers along the side of the mountain, is lined with trees, making it a picturesque spot. Located some five kilometers from Con Son Pagoda, Kiep Bac does not boast as many legendary and holy sites, but boasts great history. 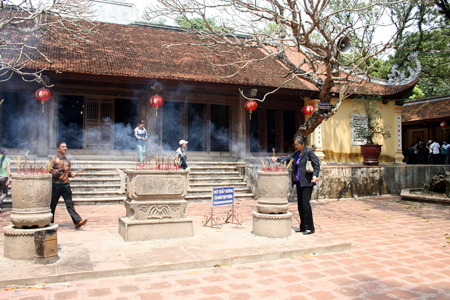 The temple, nearly 700-years-old, was built to worship Tran Hung Dao, a famous general from the Tran Dynasty, and also one of the greatest generals in Vietnam’s history. In the 13th century, Dao, born as Tran Quoc Tuan, set up a base there for storing food and training his army to fight invasions by the Mongol Empire. He successfully fought the invading army three times. The three-gate temple has three rooms with as many deities. The first room has Pham Ngu Lao, Dao’s son in law and also a general of the Tran Dynasty. The second one is for the great general, and the third one for his wife and two daughters. Next to the temple is Vien Lang, a small hill believed to be the burial site of Dao. Walking around the Con Son – Kiep Bac complex, it is difficult not to reflect on the historical importance of the place. More importantly, as we reflect on the spiritual antecedents of the place, there is a palpable sense of quiet and peace that makes the sightseeing trip acquire the status of a pilgrimage.